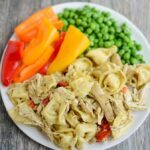 This Slow Cooker Pesto Chicken Tortellini is so easy to throw together for an easy dinner that practically cooks itself! Serve it with a side of veggies for a kid-friendly meal the whole family will love. Add onion, peppers, garlic, chicken, pesto and broth to slow cooker and cook on low 4-6 hours. Remove chicken and shred, return to slow cooker. Add tortellini, cover and cook additional 15 minutes. Stir in shredded mozzarella cheese if desired and serve. Liquid will absorb as it sits but feel free to ladle out some of the excess liquid before adding the cheese if desired. To prep for the freezer, put the onions, peppers, garlic, chicken, pesto and broth in a ziploc bag and freeze. Freeze tortellini separately. When ready to eat, thaw in the fridge and cook according to directions. Tortellini can be added frozen, no need to thaw. To cook in the Instant Pot, cook on manual for 12 minutes, shred chicken then switch to saute mode and add tortellini.